When I claim an iTunes gift card I am given the option to use it toward an Apple Music subscription. For example, I can use a $150 gift card to get a year of Apple Music for $99 and have $51 left over to buy apps or whatever. But what if I'm not sure yet whether or not I want to commit to the Apple Music Platform? It may not be an obvious decision for everyone. It certainly gave me a pause, while I considered how likely I am to purchase a HomePod in the near future, and various other factors. Is there a way to claim just $51 of the $150 gift card and buy some apps and music while I contemplate whether I actually want Apple Music? Or do I have to buy the Apple Music subscription first, and then other iTunes content? There is a free trial period for Apple Music. Your gift-card will not be claimed within the trial period. Just make sure you cancel your subscription when the free trial ends. No. At the time of this writing it is not possible to spend part of a gift card credit on iTunes Store content and then use the remaining balance toward Apple Music. 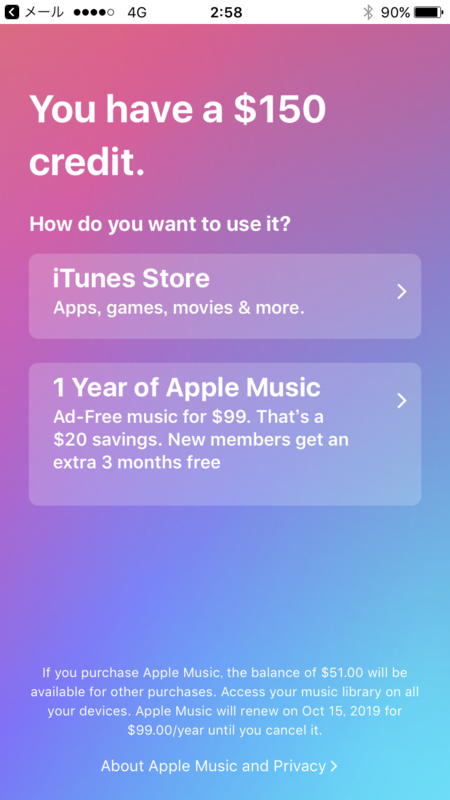 You will be presented with the following screen, where you must choose to either use the credit to get Apple Music now, or use the credit to get only iTunes Store content. In my case I chose to put the credit toward only iTunes Store content. I am still considering enrolling in Apple Music sometime in the future with my own funds. Load the iTunes gift card on to your account, buy the apps and games that you would like but be sure not to spend more than $51 as you will not have enough to buy Apple Music! And as a side note, the Apple Music free trial is totally worth it! Yes you can redeem part of an iTunes gift card because I have done this before! You need to redeem the card through the AppStore that way it is on your Apple ID I just did it yesterday! Not the answer you're looking for? Browse other questions tagged itunes apple-music gift . Can I give something using my iTunes gift card?